Adila Sedraïa (born 26 June 1984), best known by her stage name Indila, is a French singer and songwriter. She collaborated with many musicians on vocals and songwriting prior to releasing her first single, Dernière danse ("Last Dance"), in December 2013, which reached the SNEP Top 2 in France. She released her first album Mini World in February 2014. Indila was born in Paris on 26 June 1984 and raised in a household with two sisters and her mother. Her grandmother sang at weddings. Indila describes herself as a "child of the world". She is of Algerian, Egyptian, Indian and Cambodian descent and says that her stage name Indila comes from her insatiable love for India. Prior to her singing career, she worked as a tour guide at the Marché international de Rungis. She claims Enrico Macias as her first musical influence, with others influences being Michael Jackson, Ismaël Lo, Buika, Warda Al-Jazairia, Brel, Lata Mangeshkar. 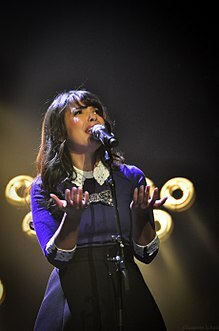 In addition to her native French, Indila has provided vocals in English, including Dreamin' with Youssoupha and Bye Bye Sonyé with DJ Abdel, and sung a Hindi-language refrain in Criminel by TLF. In 2007, she married record producer DJ Skalp, who introduced her to the world of rap and eventually collaborations with several French rappers. Indila began her music career around 2010, providing vocals for Trinité by L'Algérino, Thug mariage by Rohff, Hiro by Soprano, and composing J'ai besoin d'y croire sung by Admiral T. Hiro was her first successful collaboration, reaching number 26 in the charts in France and 27 in Belgium. She continued to collaborate with several other French rappers and DJs over the next three years, including Poussière d'empire with Nessbeal, Criminel with TLF, Press pause with OGB, Bye Bye Sonyé with DJ Abdel, Dreamin' with Youssoupha—which peaked in July 2012 at number 14 in France's SNEP charts—and Ma Reine with Axel Tony. She also composed the songs Plus Haut by Matt Pokora along with Avec Toi by Axel Tony featuring Tunisiano, in which she is credited by her real name "Adila Sedraïa". Avec toi, which was produced by Skalp, reached number 7 in the charts in France in November 2012. In November 2013, Indila released her first single—Dernière danse ("Last Dance"), from the album Mini World—which quickly found success. It reached the top 10 of the French charts on 4 January 2014 and reached number 2 on 18 January, where it remained through the week of 22 March. The song remained in the top 200 in France through April 2015, for a total of 77 weeks in the top 200. It was also a success outside France; by the end of February 2014, Dernière danse was the number one song on iTunes in Greece and Romania, and the number two song on iTunes in Turkey. The music video for Dernière danse, released 4 December 2013, reached 100 million YouTube views on 30 July 2014 and has over 520 million views as of April 2019. In February 2014, Indila released her first album, Mini World, which was produced by Skalp. In addition to Dernière danse, two other singles from the album reached the top-20 in the charts in France: Tourner dans le vide ("Spinning in the Emptiness"), which reached number 13, and S.O.S, which reached number 8. The album was the number 1 best-selling album in France the week of its debut and remained in the top-10 best-selling albums through the week of 11 October. A limited-edition CD/DVD version of Mini World was released in November 2014, with two new songs, orchestral versions of Tourner dans le vide and Love story, an acoustic version of S.O.S, and videos of live performances of several tracks from the album. A second limited-edition release of Mini World in February 2015 contained the ten tracks from the original release, the two new songs from the first limited edition, and another new song. Mini World found success both in France, where it was the third-best-selling album of 2014, and outside the country, where it was the best-seller of 2014 in Poland and second-best-seller of 2014 in Belgium. In October 2014, Indila won the MTV Europe Music Award for Best French Artist of 2014. She won Best New Album of the Year award (for Mini World) at the 30th Victoires de la Musique in February 2015. Indila was among the ten artists to receive the European Border Breakers Award in 2015. Indila is currently working on her second album. ^ a b c d e f "Indila". Gala.fr (in French). Prisma Média. Retrieved 17 April 2017. ^ "Universal Music - Indila - Bio". universalmusic.ch. Archived from the original on 3 February 2017. Retrieved 6 May 2017. ^ Bureau, Éric (27 January 2014). "Indila : le tube surprise de l'hiver" (in French). Le Parisien. Archived from the original on 27 January 2014. Retrieved 24 June 2014. ^ a b c Bureau, Eric (27 January 2014). "VIDEO. Indila : le tube surprise de l'hiver". Le Parisien (in French). Retrieved 17 April 2017. ^ "Photos : Indila : 5 choses à savoir sur LA nouvelle chanteuse qui nous fait danser !". Public.fr (in French). 30 January 2014. Retrieved 17 April 2017. ^ "The Winners: Indila". European Border Breakers Awards. Retrieved 20 April 2017. ^ a b "Indila". NRJ (in French). NRJ Réunion. Retrieved 17 April 2017. ^ Youssoupha feat Indila & Skalpovich – Dreamin' – Clip (Officiel) (in French and English). Bomayé Musik. Event occurs at 0:01–0:20, 1:03–1:46, 2:27–2:50. ^ a b Dj Abdel – Bye Bye Sonyé Feat. Indila. ^ a b c d e "Indila : La révélation musicale de ce début d'année". Booska-P (in French). 20 January 2014. Retrieved 17 April 2017. ^ "Indila performs twice in the same day in Bucharest". City Compass. 28 November 2014. Retrieved 20 April 2017. ^ a b c d e f g h i j k l m Riaud, Edouard (6 October 2014). "Focus : Indila, qui est la révélation musicale de l'année ?". Ados.fr (in French). Lagardère Digital France. Retrieved 17 April 2017. ^ Titel=Hiro&cat=s "SOPRANO – HIRO (CHANSON)" Check |url= value (help). lescharts.com (in French). Hung Medien. Retrieved 20 April 2017. ^ "YOUSSOUPHA FEAT. INDILA & SKALPOVITCH – DREAMIN' (CHANSON)". lescharts.com (in French). Hung Medien. Retrieved 19 April 2017. ^ a b Titel=Avec+toi&cat=s "AXEL TONY FEAT. TUNISIANO – AVEC TOI (CHANSON)" Check |url= value (help). lescharts.com (in French). Hung Medien. Retrieved 20 April 2017. ^ a b "INDILA – DERNIÈRE DANSE (CHANSON)". lescharts.com (in French). Hung Medien. Retrieved 20 April 2017. ^ "Le succès international d'Indila !". Contact FM. 24 February 2014. Retrieved 20 April 2017. ^ a b "Indila – Dernière Danse (Clip Officiel)". YouTube (in French). Retrieved 20 April 2017. ^ a b c d e f g h "INDILA – MINI WORLD (ALBUM)". lescharts.com (in French). Hung Medien. Retrieved 20 April 2017. ^ Hamard, Jonathan (20 January 2015). "Indila en tête du palmarès des meilleures ventes de l'année 2014... en Pologne !". Purebreak Charts (in French). Webidia. Retrieved 20 April 2017. ^ Hamard, Jonathan (4 April 2014). "Indila part (déjà) à la conquête des charts internationaux..." Purebreak Charts (in French). Webedia. Retrieved 20 April 2017. ^ a b "Victoires: Indila album révélation de l'année". rtbf.be (in French). Agence France Presse. 16 February 2015. Retrieved 20 April 2017. ^ "MTV EMA 2014 : Indila meilleure artiste française, le palmarès complet". BFMTV (in French). 10 November 2014. Retrieved 20 April 2017. ^ "Hozier wins European Border Breakers Award". Hot Press. Retrieved 20 April 2017. ^ "EBBA Music Award Show 2015". Creative Europe. Retrieved 20 April 2017. ^ a b "Indila". ultratop.be. Retrieved 6 May 2017. ^ a b c d "Indila". ultratop.be. Retrieved 6 May 2017. Mini World: "Official Retail Sales Chart :: sales for the period 02.03.2015 – 08.03.2015". OLiS. Retrieved 13 March 2015. ^ a b Hung, Steffen. "Indila - hitparade.ch". hitparade.ch. Retrieved 6 May 2017. ^ leblogtvnews.com. "Indila reçoit des mains de Michel Drucker un disque de diamant. - Leblogtvnews.com". Retrieved 6 May 2017. ^ www.onyx.pl, Onyx Sp. z o.o., tel. +48 22 3377222,. "ZPAV :: Bestsellery i wyróżnienia - Wyróżnienia - Diamentowe płyty CD - Archiwum". bestsellery.zpav.pl. Retrieved 6 May 2017. ^ a b "ultratop.be - ULTRATOP BELGIAN CHARTS". ultratop.be. Retrieved 6 May 2017. ^ "Indila – Dernière danse (Top Airplay)". ZPAV. Retrieved July 21, 2014. "Indila – S.O.S (Top Airplay)". ZPAV. Retrieved January 28, 2015. ^ "Media Forest – March 29, 2014". Archived from the original on June 28, 2015. ^ "Number 1 – April 15, 2014". ^ "Ils ont marqué l'année 2014 à l'export - SNEP". 20 January 2015. Retrieved 6 May 2017. ^ "Ne2s – Nessbeal". iTunes France (in French). Apple. Retrieved 17 April 2017. ^ "H MAGNUM feat. INDILA – Garde l'équilibre (Clip Officiel)". YouTube (in French). Retrieved 17 April 2017. ^ "L'Algérino – Trinité (Clip Officiel HD)". YouTube (in French). 29 March 2010. Retrieved 17 April 2017. ^ a b c d "ADILA SEDRAIA". lescharts.com (in French). Hung Medien. Retrieved 20 April 2017. ^ "DJ ABDEL FEAT. INDILA – BYE BYE SONYÉ (CHANSON)". lescharts.com (in French). Hung Medien. Retrieved 20 April 2017. ^ "SULTAN [FR] – PLUS JAMAIS (CHANSON)". lescharts.com (in French). Hung Medien. Retrieved 20 April 2017.